, called more frequently Julio Romano, a very eminent painter, was born in 1492, and was the principal disciple of Raphael, his heir, the cominuator of his works, and himself at the head of a school. Whilst a pupil, he imbibed all his master’s energy of character, and chiefly signalized himself in subjects of war and battles, which he represented with equal spirit and erudition. As a designer, he commands the whole mechanism of the human body; and, without fear of error, turns and winds it about to serve his purposes; but sometimes oversteps the modesty of nature. 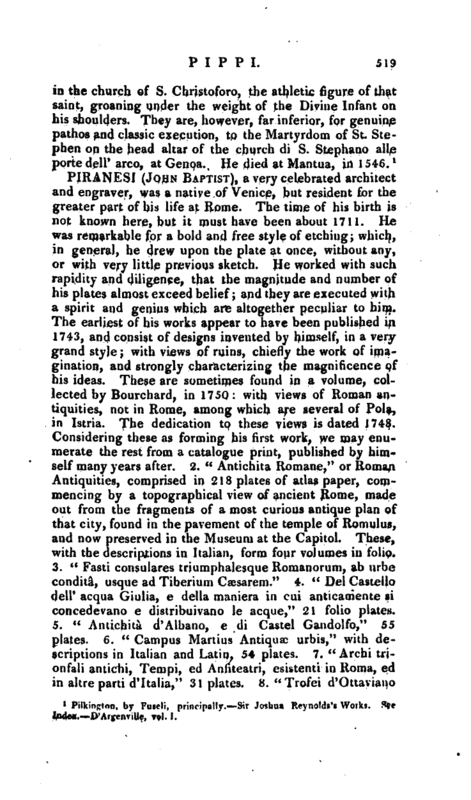 Vasari prefers his drawings to his pictures, as the original fire which distinguishes his conception was apt to evaporate, in the longer process of finish: and some have, with more reason, objected to' the character of his physiognomies, as less simple than vulgar; and often dismal and horrid, without being terrible. In colour, whether fresco or oil, his hand was as expeditious, a.nd his touch, especially in the former, as decided, as his eye and choice were ungenial: bricky lights, violet demitints, black shades, compose, in general, the raw opaque tone of his oil-pictures. The style of his draperies is classic, but the management of the folds generally arbitrary and mannered; the hair and head-dresses of his women are always fanciful and luxurious, but not always arranged by taste, whilst those of the men frequently border on the grotesque. He came to Mantua, and there found antique treasures, of which the statues, busts, and basso-relievos, at. present in the academy, are but insignificant remains. To the stores of the Gonzaghi he added his own, rich in designs of Raphael, and studies and plans from the antique; for no designer ever possessed such industry with so much fire, so much consideration with such fecundity, or | combiued with equal rapidity such correctness, and with great recondite knowledge in mythology and history, that popularity and ease in treating it. 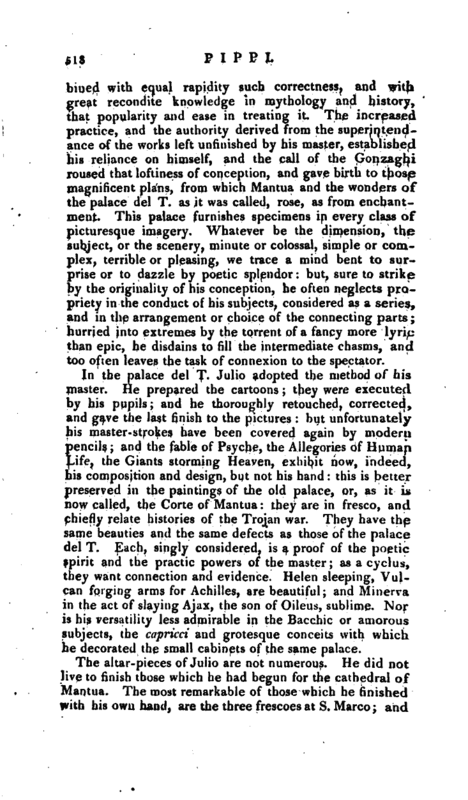 The increased practice, and the authority derived from the superintendance of the works left unfinished by his master, established his reliance on himself, and the call of the Gonzaghi roused that loftiness of conception, and gave birth to those magnificent plans, from which Mantua and the wonders of the palace del T. as it was called, rose, as from enchantment. This palace furnishes specimens in every class of picturesque imagery. 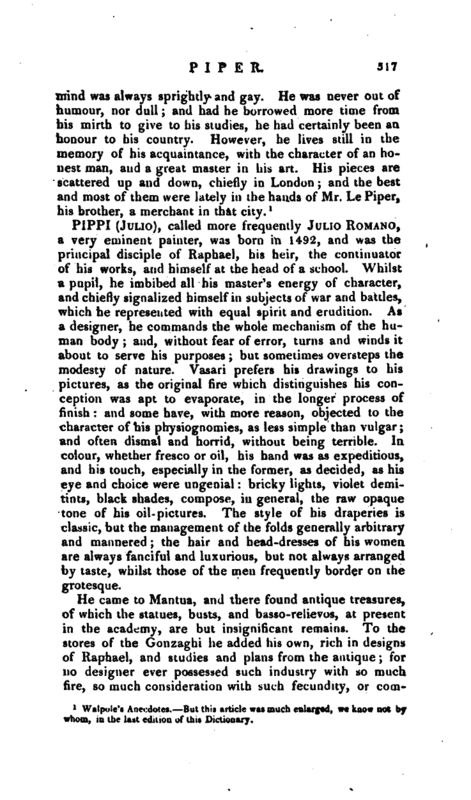 Whatever be the dimension, the subject, or the scenery, minute or colossal, simple or complex, terrible or pleasing, we trace a mind bent to surprise or to dazzle by poetic splendor: but, sure to strike by the originality of his conception, he often neglects propriety in the conduct of his subjects, considered as a series, and in the arrangement or choice of the connecting parts; hurried into extremes by the torrent of a fancy more lyric than epic, he disdains to fill the intermediate chasms, and too often leaves the task of connexion to the spectator. In the palace del T. Julio adopted the method of his master. He prepared the cartoons; they were executed by his pupils; and he thoroughly retouched, corrected, and gave the last finish to the pictures: but unfortunately his master-strokes have been covered again by modern pencils; and the fable of Psyche, the Allegories of Human Life, the Gian.ts storming Heaven, exhibit now, indeed, his composition and design, but not his hand: this is better preserved in the paintings of the old palace, or, as it is now called, the Corte of Mantua: they are in fresco, and chiefly relate histories of the Trojan war. They have the same beauties and the same defects as those of the palace del T. Each, singly considered, is a proof of the poetic spirit and the practic powers of the master; as a cyclus, they want connection and evidence. Helen sleeping, Vulcan forging arms for Achilles, are beautiful; and Minerva in the act of slaying Ajax, the son of Oileus, sublime. Nor is his versatility less admirable in the Bacchic or amorous subjects, the capricci and grotesque conceits with which he decorated the small cabinets of the same palace. Pi1kington, by Fuseli, principally Sir Joshua Reynolds’s Works; See Index. D’Aigenville, vol. I.